My 20+-year experiment with meal spontaneity has been mostly a loser, so I am preparing myself for menu planning. 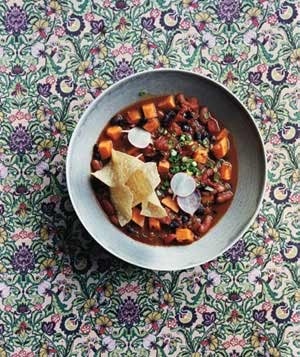 In the meantime, I’m looking for reliab le, not-too-complicated recipes like this super healthy and flavorful slow-cooker chili from Real Simple magazine. If you’re in the urban U.S. you can probably find fire-roasted canned tomatoes. I omitted the 1 t. salt because canned beans, canned tomatoes, and chili powder usually have salt added. Finally, something in Real Simple actually is. Will try this! Welcome all slow cooker recipes! Except my pet peeve–those that involve 10-20 minutes of browning, sauteeing, whatever, and then say ‘put on low for 4 hours.’ If it can’t go through a whole work day, what’s the point, right? Thanks, Angie, I just skimmed your board and saw a few recipes I’d like to try! Slow cooking for two — that’s the quantity I need, for sure. My crock pot was an unrequested gift and it stayed in the box unopened for *years. * I’m just warming up to it (no pun intended).